Edit the preferences of the software; Choose your favorite mouse settings; Display, move and resize windows and browsers on the screen; Create additional toolbars. 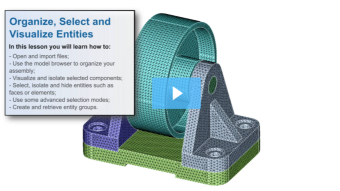 Open and import files; Use the model browser to organize your assembly; Visualize and isolate selected components; Select, isolate and hide entities such as faces or elements; Use some advanced selection modes; Create and retrieve entity groups. 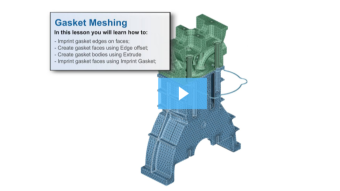 Import a CAD geometry; Quickly tetmesh a solid body using different global settings; Export your mesh. 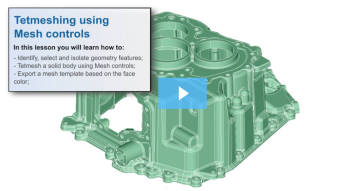 Identify, select and isolate geometry features; Tetmesh a solid body using Mesh controls; Export a mesh template based on the face color. 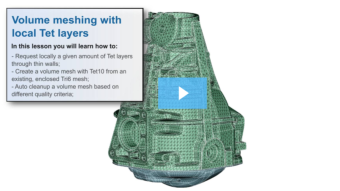 Request locally a given amount of tet layers through thin walls; Create a volume mesh with Tet10 from an existing, encolsed Tri6 mesh; Auto cleanup a volume mesh based on different quality criteria. Hex mesh 2.5D geometries using extrude; Hex mesh axial symmetric bodies; Edit the number of hex layers through a body. Shiva Tool Tech is an automotive manufacturing focused, industrial powerhouse based in Pune, India. With over 25 years of experience in designing and manufacturing of gravity die casting (GDC), low-pressure die casting (LPDC), high-pressure die casting (HPDC) Dies, the company supports customers from manufacturing process design to the production stage. Manufacturing processes include milling, drilling, hardening, grinding, Computer Numerical Control (CNC) machining, Electrical Discharge Machining (EDM), inspection and polishing to get the final assembly of the casting die. 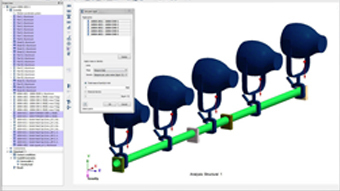 Gauge optimization, size and shape, and shell optimization, can be used to improve an existing design without altering its overall architecture. 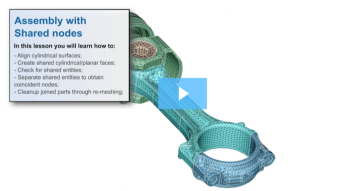 3D topology optimization can be used when a significant re-design is desired because it identifies the optimal load paths of a structure and recommend material reduction. 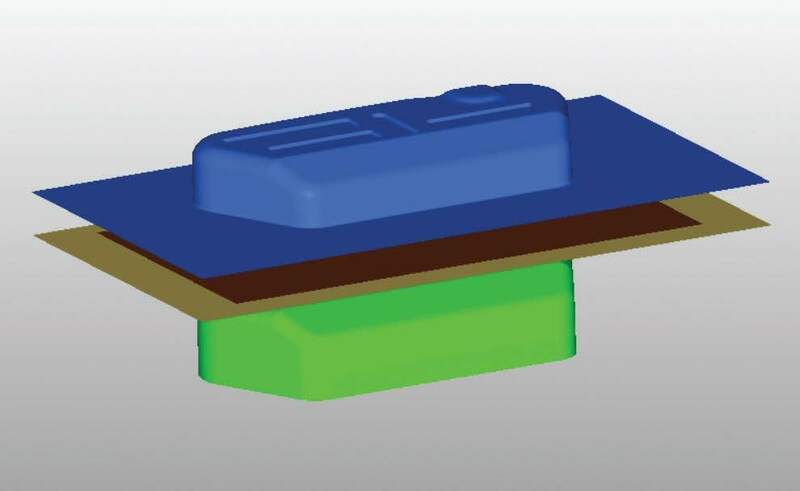 The material layout produced in the 3D topology is then interpreted into a concept design which is dimensioned and fine-tuned with the gauge, size, and shape approaches resulting in a final structure. Do you want to learn how to execute all the techniques mentioned? Step-by-step tutorials are available now for download! At Elaphe, the engineers have been facing the NVH challenges from the very beginning. 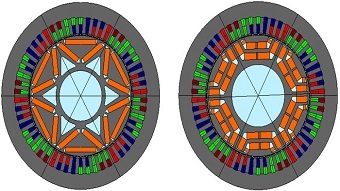 The topology of this electric motor, which on the one hand enables the team to use the otherwise empty space inside the wheel, can on the other hand, result in some new and unexplored NVH challenges. 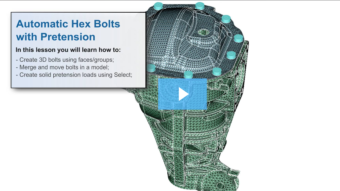 The experience over the years has proven that NVH is a bottleneck in the design cycle of Elaphe's motors and this was the main motivation for a more automated and more user-friendly NVH simulation workflow. Within the NVH, noise radiation was the area Elaphe was most interested in. real-time, detailed information about the victim’s injuries. 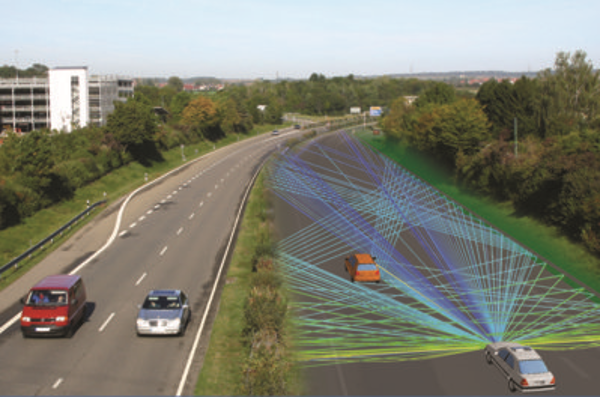 In an effort to transform data received from the car sensors into meaningful information about the victim's injuries, the MDGo team began applying crash simulation using Altair Radioss™. The Altair Startup program was a major help to the Israeli startup company in creating a system which automatically alerts first responders and hospitals of accidents, and reports on potential injuries. 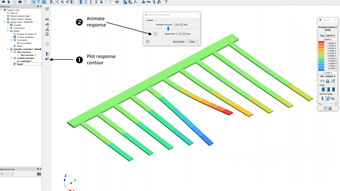 Mariana Mendes Leal, Structural Engineer at OHB System AG, talks about how they are able to automate their FE analysis workflow utilizing the Altair HyperWorks suite and tools like Altair’s Automated Report Director. 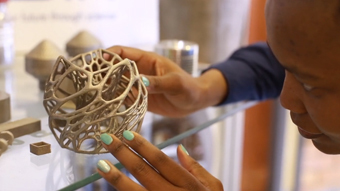 The South African aviation manufacturing solutions provider Aerosud and the South African Council for Scientific and Industrial Research (CSIR) teamed up to launch a challenging 3D printing project, Aeroswift. 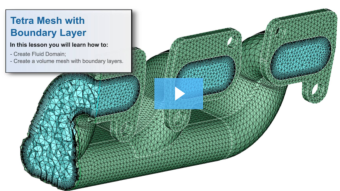 Aeroswift collaborated with Altair to develop a methodology for designing large additively manufactured products. 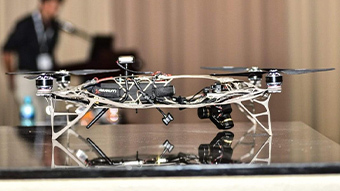 An Unmanned Aerial Vehicle (UAV) frame was designed as a demonstration and subsequently printed on Aeroswift. 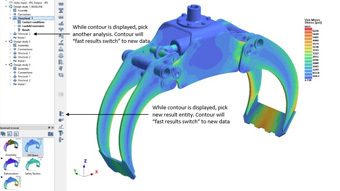 To improve manufacturability while meeting all component requirements, the project engineers used Altair Inspire™ and its topology optimization capabilities in the design process. 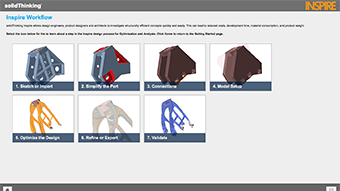 Altair SimSolid tutorial projects contain CAD models, SimSolid project files and complete workflow instructions. They are intended to complement the SimSolid Fast Start Training Guide with additional instructions on several typical use cases. 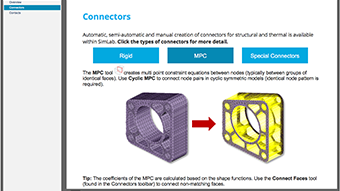 They are a great resource which allow you to compare SimSolid against your existing FEA solutions. Given EVs are gaining momentum and the recent Govt. of India’s strict localization norms in EVs to avail incentives, Altair announces a 3-part webinar series to introduce its powerful and most comprehensive industry solution set for E-mobility from concept till end use. 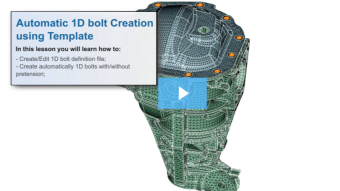 See how Altair Feko helped reduce heat during MRI procedures in DBS implants. 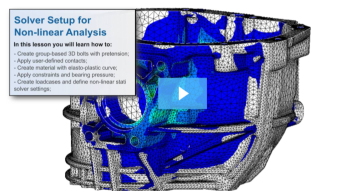 Learn how Altair Compose™ can help you reduce the number of tools required to import data from Finite Element Analysis (FEA), then perform useful post-processing calculations, and visualize the results in useful ways. Given EVs are gaining momentum and the recent Govt. of India’s strict localization norms in EVs to avail incentives, Altair announces a 3-part webinar series to introduce its powerful and most comprehensive industry solution set for E-mobility from concept till end use. 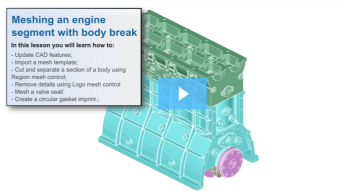 Open to startups, OEM and supplier alike, we invite you to join our 3-part live webinar series. 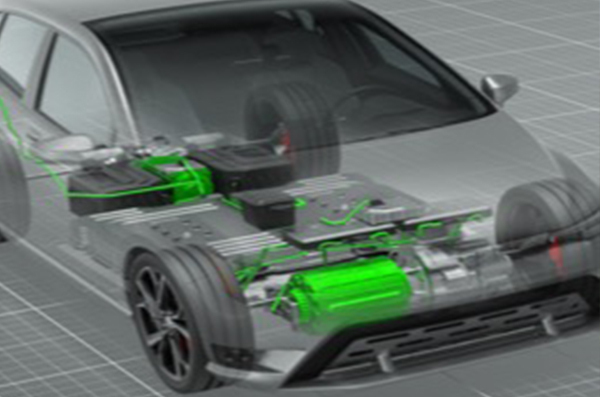 We will discuss the various challenges in EV systems and how Altair solutions play an important role in the design & development stage. 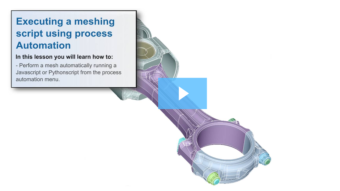 Namely, how you can cut down development time and cost while improving your designs, how you can rapidly prototype your ideas, tame the complexities involved in a highly complex system and lots more. We will highlight some unique challenges for EVs specific to India and discuss how to address them. This webinar shows how Altair WinProp considers the full environment including buildings, cars, street objects in order to get accurate representations of the radio waves impinging on the installed car antennas and the multipath radar channels including reflections, diffractions and scattered contributions. For the efficient analysis the car objects can be also replaced by their corresponding radar cross sections (pre-calculated in Altair Feko). 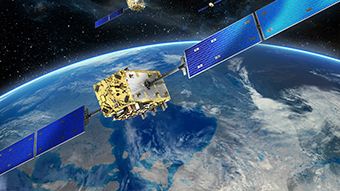 Thus allowing the realistic and fully reproducible evaluations of different options for the antennas and sensors including their integration and configuration. Czech company Duratec Ltd. develops handmade bike frames using both aluminium and composite materials. 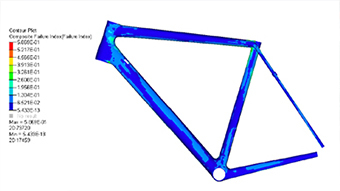 For a recent project at Duratec presenting the latest approach in development of carbon fiber optimization of the bike frame, Altair HyperWorks was used for model creation in Altair HyperMesh, optimized via the Altair OptiStruct code and evaluated in Altair HyperView in the development and optimization of a lightweight composite racing bike frame. 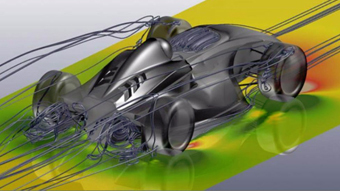 Altair Virtual Wind Tunnel software is an environment for doing External Aerodynamic CFD analysis. This book takes you step by step through the basics of CFD to bring clarity to the user regarding the fundamentals of the subject. 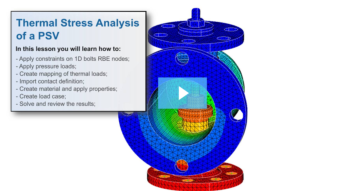 In this course, you will have the opportunity to learn about the Inspire Cast 2019 interface along with tools and workflows contained within Inspire Cast. 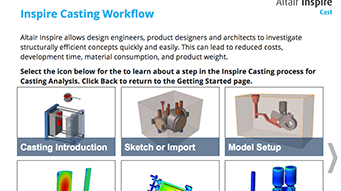 Modules contained within the course provide detailed descriptions of the tools and workflows within Inspire Cast. You will also have the opportunity to watch and perform hands-on exercises within each module. 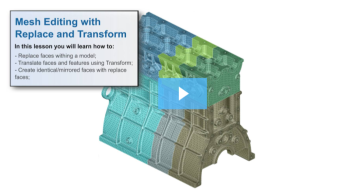 In this course, you will have the opportunity to learn about the Inspire Form 2019 interface along with tools and workflows contained within Inspire Form. 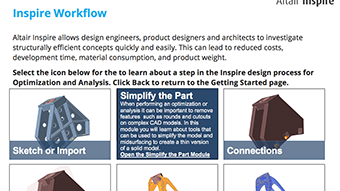 Modules contained within the course provide detailed descriptions of the tools and workflows within Inspire Form. You will also have the opportunity to watch and perform hands-on exercises within each module. 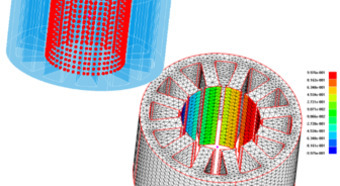 Altair SimSolid is a next generation, high capacity, structural FEA product. 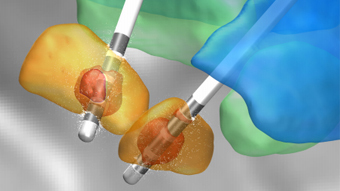 It uses new computational methods which operate on original, unsimplified CAD geometry and does not need a mesh. 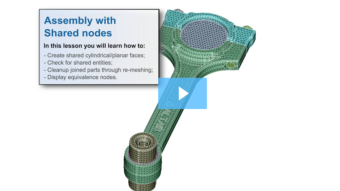 This training guide provides details on how to connect and manage large assemblies in SimSolid. 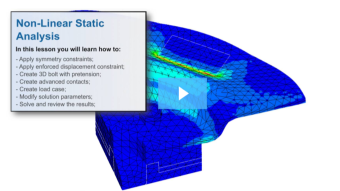 For general overview, please see SimSolid Fast Start Training Guide. 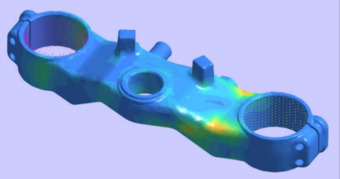 Altair SimSolid is a next generation, high capacity, structural FEA product. 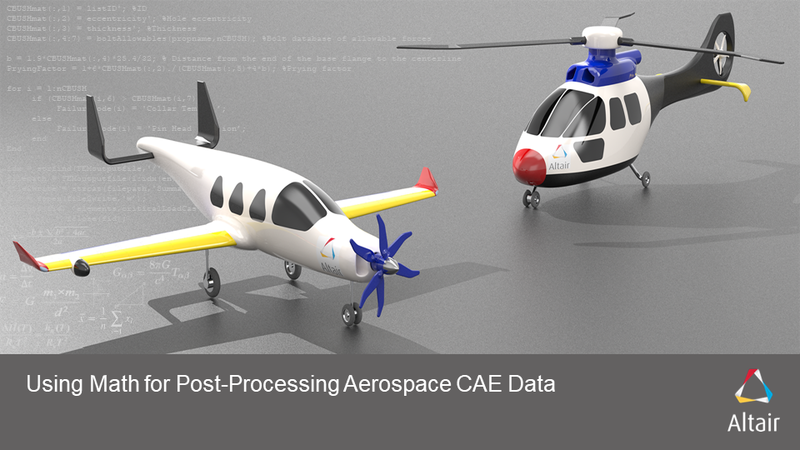 It uses new computational methods which operate on original, unsimplified CAD geometry and does not need a mesh. 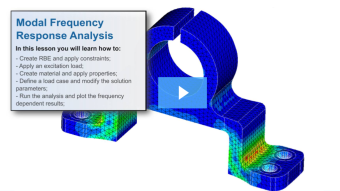 This training guide provides details on how to perform dynamic analysis in SimSolid including modal frequency response, transient response and random response analysis. 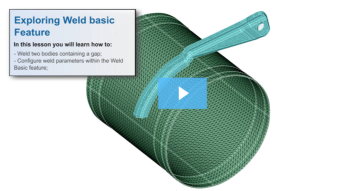 For general overview, please see SimSolid Fast Start Training Guide. 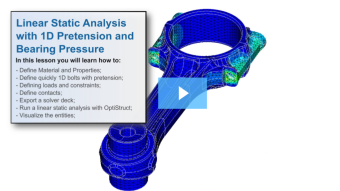 Altair SimSolid is a next generation, high capacity, structural FEA product. 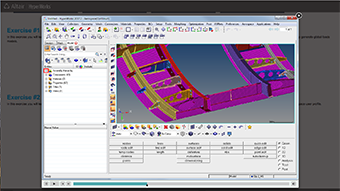 It uses new computational methods which operate on original, unsimplified CAD geometry and does not need a mesh. 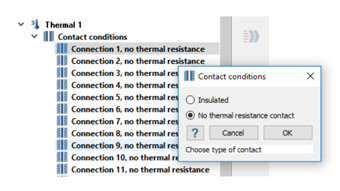 This training guide provides details on how to perform steady state thermal analysis including convection and conduction. 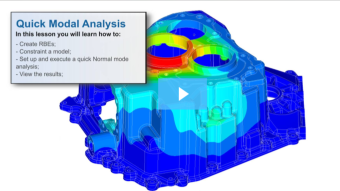 It also talks about thermal stress analysis in SimSolid. 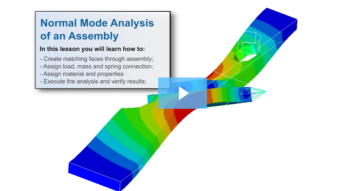 For general overview, please see SimSolid Fast Start Training Guide. 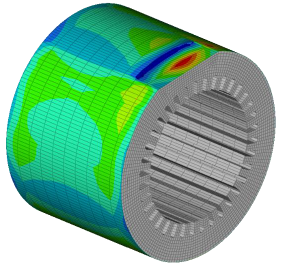 Altair SimSolid is a next generation, high capacity, structural FEA product. 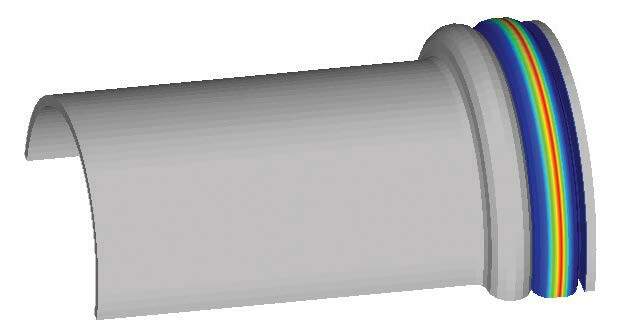 It uses new computational methods which operate on original, unsimplified CAD geometry and does not need a mesh. 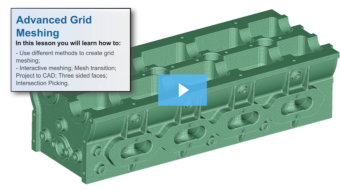 This training guide provides more details on the workflows and the technology behind SimSolid. This document is a great resource to get you going. 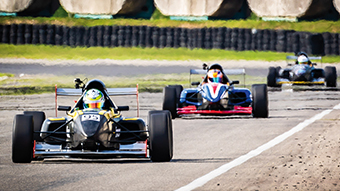 Israeli motorsport company Griiip has designed a new, fast and professional race car that combines efficiency in racing with a competitive purchase price and low running costs, to make it more affordable. By harnessing the power of data, Griiip has created the first smart connected race car – the G1 – and with it, an entirely new racing series. Accessing the software via Altair's new Startup Program, Griiip engineers employ several products from the Altair HyperWorks™ suite, among these Altair Radioss™ for crash simulation, Altair OptiStruct™ for structural optimization, general FE analysis as well as Altair HyperMesh™ and Altair HyperView™ for pre- and post-processing tasks in the development of race cars. 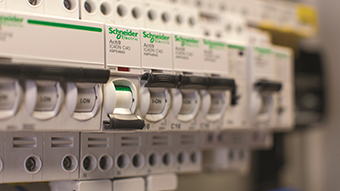 An Altair customer for many years, Schneider Electric at first used only Altair Flux; now the company has extended their usage to several more software products in the Altair HyperWorks suite, including solutions such as Activate, MotionSolve, OptiStruct, and others to apply co-simulation in their development processes. Schneider feels their collaboration with Altair is more like a partnership than the standard supplier-OEM relationship. 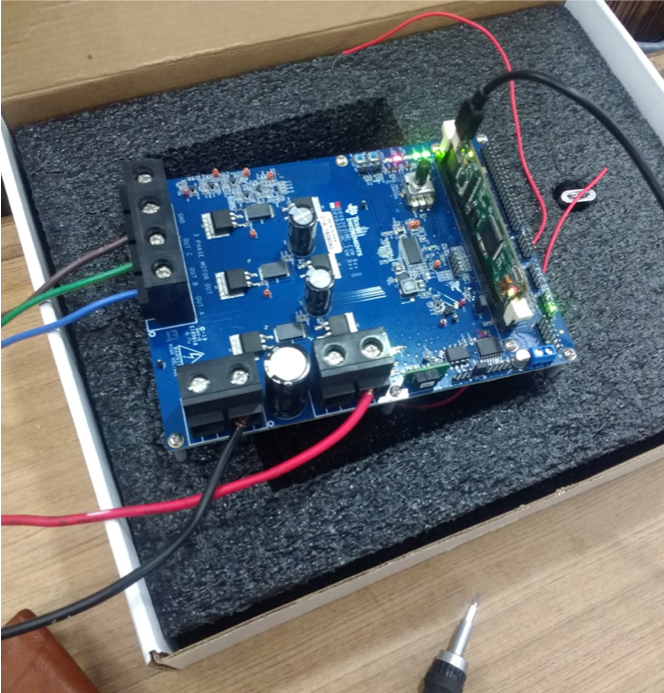 Today, most products are complex mechatronic combinations of advanced technologies, mixing electrical parts with controllers and embedded software. 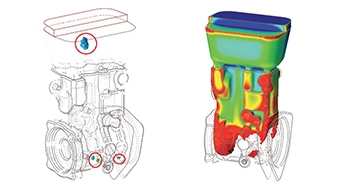 To efficiently manage innovative products, organizations are turning to a Model-Based Development approach for concept studies, control design, multi-domain system simulation and optimization. 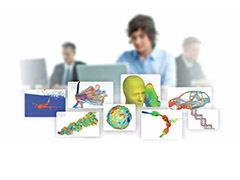 To meet this demand, Altair’s simulation and optimization suite aims to transform design and decision-making throughout product lifecycles with their multi-disciplinary software tools and consultancy services. 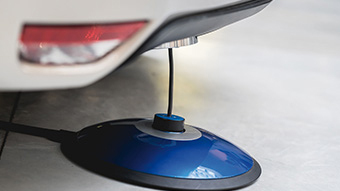 French startup Gulplug, located in Grenoble, France, has set out to revolutionize plug and charging technology used in today's electric and hybrid vehicles. To create new products and to drive innovation in the market, Gulplug is using Altair Flux™ and the Altair startup program. 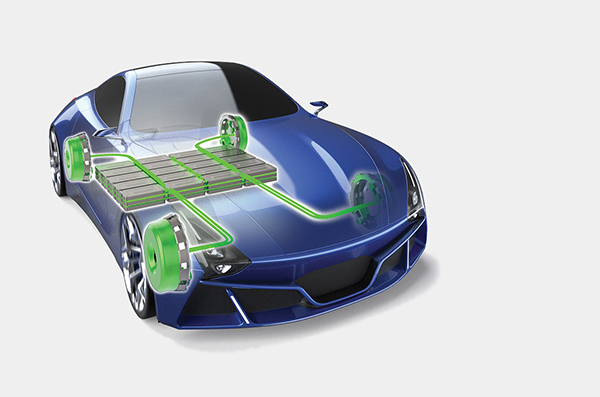 Flux helped Gulplug to model and create an innovative, clean, automatically self-plugging, magnetic based charging solution for electric vehicles. 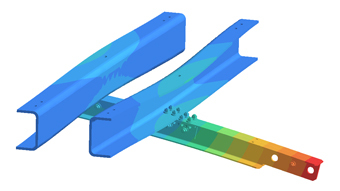 Many commercial aircraft are designed so that fuselage skins can elastically buckle below limit load and continue to operate safely and efficiently. This design regime makes for a very lightweight semi-monocoque structure compared to a non-buckling design. 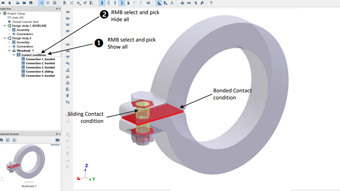 Therefore, predicting the local buckling, post-buckling behavior, and failures are critical to design and optimization of this kind of structure. The local panels buckle in a combination of compression and shear. 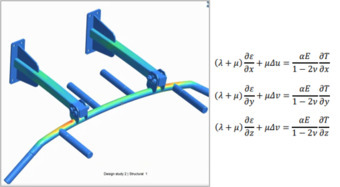 Excess compression is redistributed to surrounding axial members (frames and stringers) and shear is continued to be carried by the buckled panels via tension parallel to the buckle waves. The compression redistribution and diagonal tension put special strength considerations on all involved structural components. 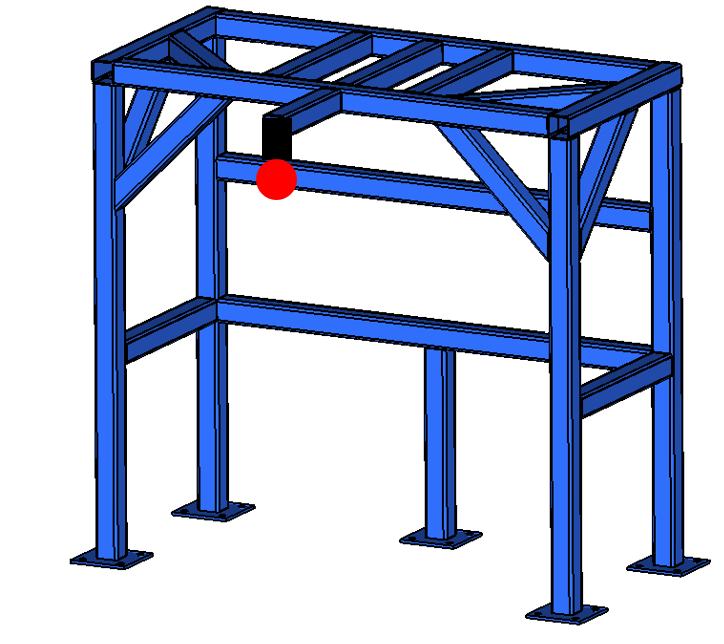 This post-buckling behavior and the analysis method are both called intermediate diagonal tension (IDT). 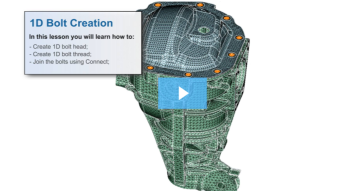 The purpose of this self-paced course is to provide an introduction to SimLab. The course contains information on the tools available in SimLab and provides exercises to provide you with practice in using SimLab. 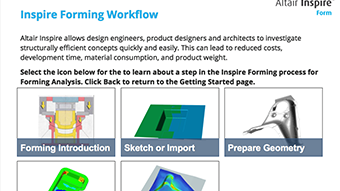 Models can be downloaded from within the module to practice the exercises on your own. 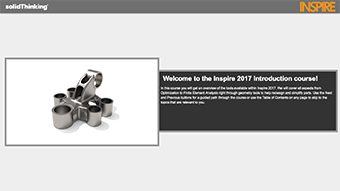 In this course you will have the opportunity to learn about the Inspire 2018 interface along with tools and workflows contained within Inspire. Modules contained within the course provide detailed descriptions of the tools and workflows within Inspire. You will also have the opportunity to watch and perform hands on exercises within each module. Note: This course requires a login to Connect to view. The HyperWorks for Aerospace self-paced course covers the critical processes used in the creation of FEA models in the Aerospace industry. 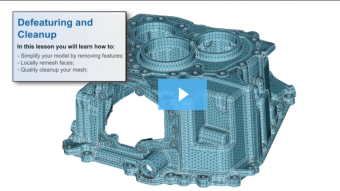 This course contains 12 modules covering aspects from model setup to post processing. Each module contains background information on the tools used and practical exercises with recorded demonstrations to help you get familiar with the tools and processes. 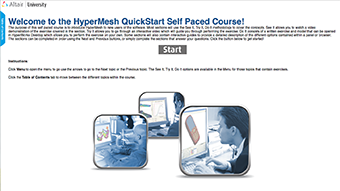 The purpose of this self paced course is to introduce HyperMesh to new users of the software. Most sections will use the See It, Try It, Do It methodology to cover the concepts. 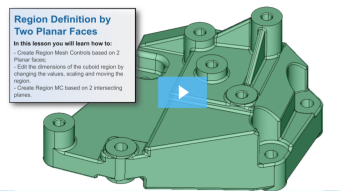 See It allows you to watch a video demonstration of the exercise covered in the section. Try It allows you to go through an interactive video which will guide you through performing the exercise. Do It consists of a written exercise and model that can be opened in HyperMesh which allows you to perform the exercise on your own. Some sections will also contain interactive guides to provide a detailed description of the different options contained within a panel or browser. Note: This course requires a Connect login to view. 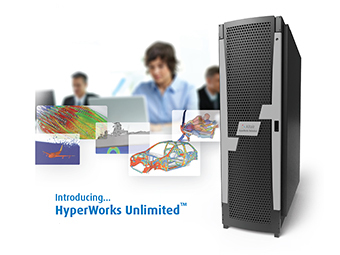 Altair HyperWorks Unlimited is a fully managed, HPC appliance for CAE available in both physical and virtual formats, offering unlimited use of all Altair software. Altair’s CAE cloud appliances address the unique needs of enterprises by simplifying access to an HPC infrastructure at an affordable cost. 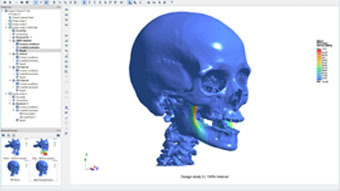 This allows engineers and scientists access to hardware, software, and HPC support that enables robust product designs. 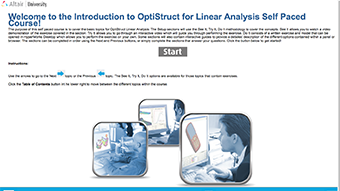 The purpose of this self paced course is to cover the basics of OptiStruct Optimization. 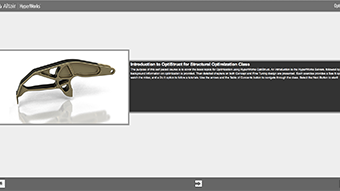 The course contains modules introducing the basic optimization types and giving an over of each. Many exercises are available in the modules that use the See It, Try It methodology. 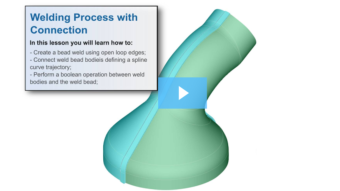 See It allows you to watch a video demonstration of the exercise covered in the section, while Try It gives you a pdf and model to try it in the software on your own. 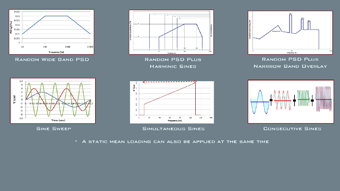 - Other operational load cases are applied as the subsequent load cases to the de-cambering load. 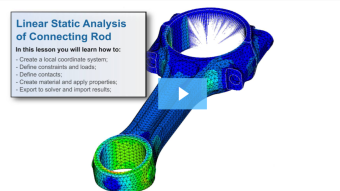 Topology optimization is conducted with responses from both de-cambering load case and subsequent load cases. - All subsequent analysis must take into account the de-cambering held in place by the welds. The de-camber is a "large displacement" formulation and the loading happens via sliding contact with the payload box. 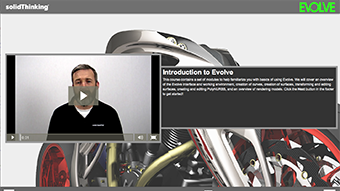 This course contains a set of modules to help familiarize you with basics of using Evolve. We will cover an overview of the Evolve interface and working environment, creation of curves, creation of surfaces, transforming and editing surfaces, creating and editing PolyNURBS, and an overview of rendering models. The purpose of this self paced course is to provide an introduction to SimLab. 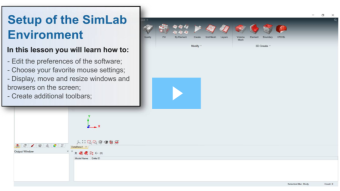 The course contains information on the tools available in SimLab and provides exercises to provide you with practice in using SimLab. 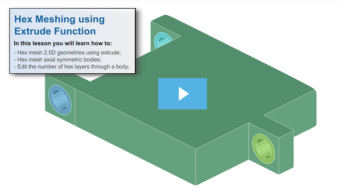 Models can be downloaded from within the module to practice the exercises on your own. 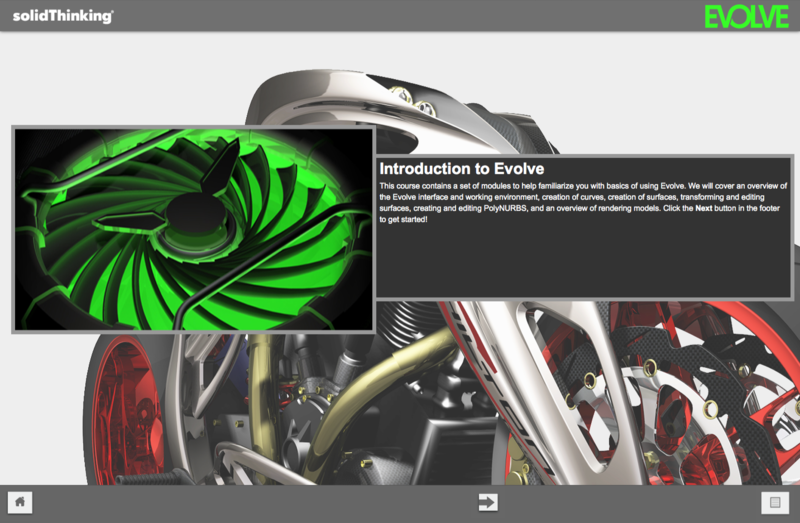 The menu in the course (on the left) can be used to jump to a specific module. 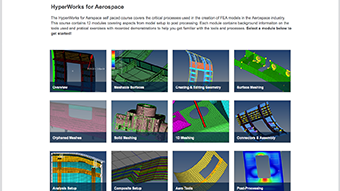 The HyperWorks for Aerospace self paced course covers the critical processes used in the creation of FEA models in the Aerospace industry. 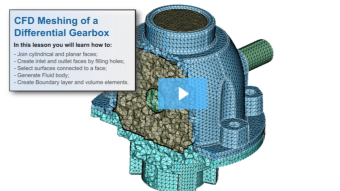 This course contains 12 modules covering aspects from model setup to post processing. 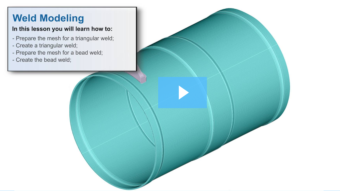 Each module contains background information on the tools used and practical exercises with recorded demonstrations to help you get familiar with the tools and processes. 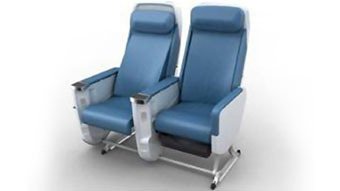 Zodiac Seats (now Safran Seats) designs, certifies and assembles innovative, customizable and high-added-value products. 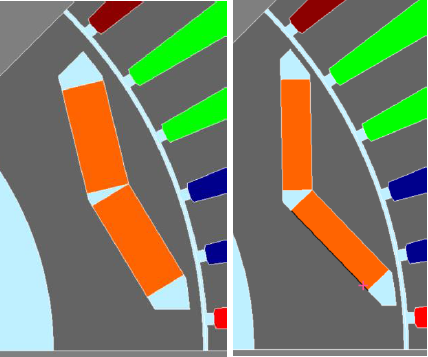 For optimizing seat ergonomics to reduce passenger discomfort, Zodiac Seats France (ZSFR) employ Altair HyperWorks to develop biomechanical models which help with optimization of the seat form and structure. 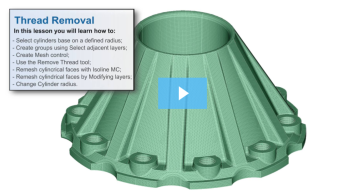 See how McFarlane Hand and Upper Limb Centre in London, Ontario is uses Altair SimSolid to evaluate the biomechanics of bone stresses. Serapid, the developer and manufacturer of the original Rigid Chain, designs and manufactures telescopic mechanical actuators for the horizontal and vertical movement of heavy loads. 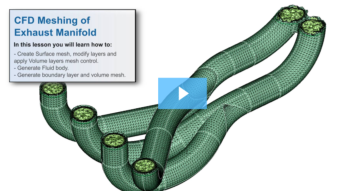 See how they use Altair SimSolid to aid in gravity loads of complete structure simulation. 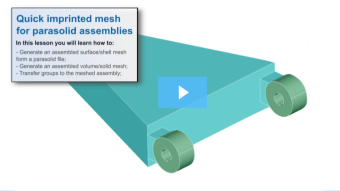 Altair SimSolid takes a different approach, analyzing fully featured CAD assemblies directly with no absolutely no mesh. 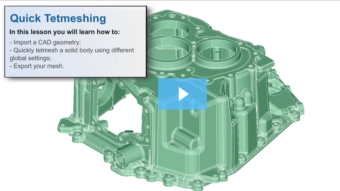 This presentation shows how Altair HyperStudy can involve several Altair solvers to consider different requirements into a single optimization and will be illustrated through various examples. 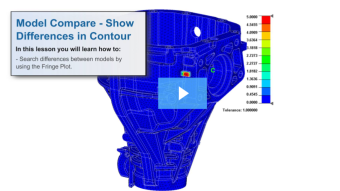 This presentation shows, through a complete example how the Altair platform for innovation helps machine designers to manage temperature distribution and evolution. Established in the year 1969, Imperial Auto is one of the biggest integrated manufacturers of ‘Fluid Transmission Products (FTPs) in the world. The company has eight dedicated manufacturing and assembly plants in India. The grand vision of the company’s top management can be easily gauged from the strategic and technical alliances that Imperial has formed with major international players in their industry. INTECH DMLS is playing the visionary role in the field of metal-based DMLS 3D printing in India since its inception in 2012. 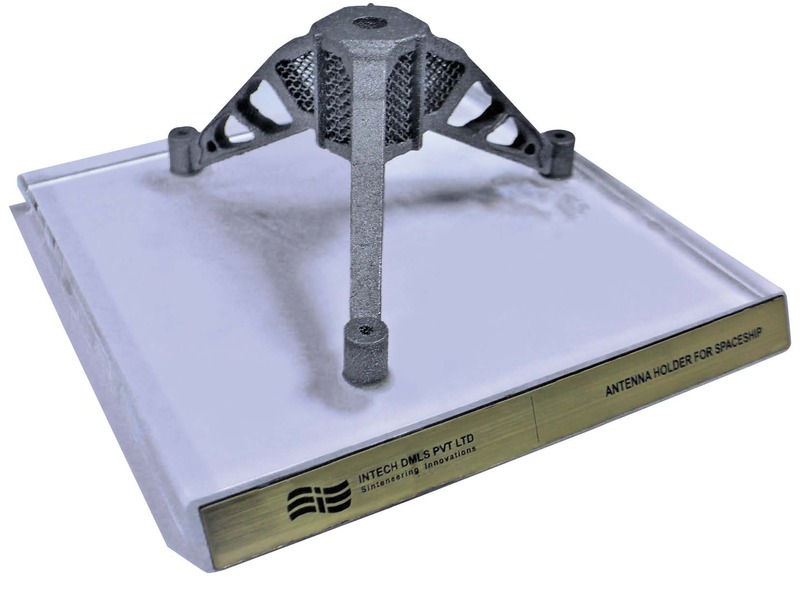 The company with this rich expertise in metallurgy and machining, established themselves rapidly as the leader of the Metal Additive Manufacturing industry in India. Sinteneering Innovations®, the company’s tagline signifies its commitment to innovation in manufacturing and marks the beginning of a new era in metal manufacturing. Pragati Engineering, established in 2004, is one of the leading press tool design and manufacturing companies in India. The company has a national reach and successfully carries out projects riding on the robust shoulders of qualified and dynamic engineers from their Design department and Tool Room division. The company’s competency lies in manufacture of Press Tools Fixtures and Panel Checkers for various critical sheet-metal components and assemblies. With new technologies, facilities, and experience in Press Tooling, the company is confident of seamlessly catering to any requirement in the sheet-metal forming segment.